We’d love your help. 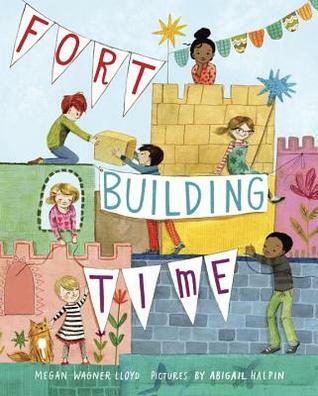 Let us know what’s wrong with this preview of Fort-Building Time by Megan Wagner Lloyd. Grab your blankets and pillows! From the creators of Finding Wild, a new picture book that follows the changing of the seasons and is as cozy as a fort. Winter, spring, summer, fall. Each season brings new materials to make the perfect fort. From leaves to snow, from mud to sand, there is a different fort throughout the year. As a group of friends explore and build through Grab your blankets and pillows! From the creators of Finding Wild, a new picture book that follows the changing of the seasons and is as cozy as a fort. Winter, spring, summer, fall. Each season brings new materials to make the perfect fort. From leaves to snow, from mud to sand, there is a different fort throughout the year. As a group of friends explore and build through the seasons, they find that every fort they make is a perfect fort. To ask other readers questions about Fort-Building Time, please sign up. I expected this book to be more *active* in terms of showing children actively engaged in *building* forts. Instead, we see some really beautiful forts *after* they have been built and we see the children enjoying being in/around/on the forts. It's clear the children built the forts, but we don't see anything of the construction process until the final pages of the book for only one fort out of the five shown. That said, I did really enjoy the book for what it is: a celebration of the seasons an I expected this book to be more *active* in terms of showing children actively engaged in *building* forts. Instead, we see some really beautiful forts *after* they have been built and we see the children enjoying being in/around/on the forts. It's clear the children built the forts, but we don't see anything of the construction process until the final pages of the book for only one fort out of the five shown. Fort-Building Time is a simple book about a group of friends building forts throughout the year. When the book begins, it's just three of them building a snow fort in the winter. But as the seasons progress, new friends are added and by end of the book, there are seven friends playing the fort-building game. The setup kind of reminded me of The Quiet Book with all of its descriptive words for each season. As such, there's no real story, per se. There's just a bunch of kids doing various activitie Fort-Building Time is a simple book about a group of friends building forts throughout the year. When the book begins, it's just three of them building a snow fort in the winter. But as the seasons progress, new friends are added and by end of the book, there are seven friends playing the fort-building game. The setup kind of reminded me of The Quiet Book with all of its descriptive words for each season. As such, there's no real story, per se. There's just a bunch of kids doing various activities throughout the year. And those activities (almost) always include building a fort. Aside from that, I like the idea and I like the pictures. This is a diverse group of friends, who even appear to be including someone's baby sibling in the fun. The dog is pretty cute, too (and plays a role in the narrative). So many kids like to build forts, so there's probably a decent-sized audience for this book. It's a little poetic at times and doesn't have much story, but the pictures are fun to look at as they cycle through the seasons. I just wish I knew what happened to fall's fort. FORT-BUILDING TIME is an absolutely delightful and lyrical story about the fun of creation and playing outdoors throughout the seasons. The illustrations are whimsical and filled with detail, and the text itself is artwork in itself. This title is a required purchase for elementary libraries and will be a perfect storytime read for primary grades. Thanks to the author and publisher for providing me with a review copy of this title. A bit too much text but darling illustrations. Many thanks to the @kidlitexchange network for the chance to review this title. All opinions are my own! While I love to see children engaged in organized sports and activities, nothing warms this teacher's heart quite like creativity and imaginative play. Fort Building Time celebrates the idea that children can make their own joy! The characters design different forts all year long, based on the time of year. The charming illustrations and text reinforce seasonal concepts. This book will make a Many thanks to the @kidlitexchange network for the chance to review this title. All opinions are my own! A lot of color, but mostly used for the effect of vomiting all over the page. Illustrator uses a hackneyed style that can be found in half the picture books published in the last five years. The physical portrayal of the figures is not realistic. The text is boring, running the same forced construction into the ground. The children seem a little older than I am accustomed to in picture-books like this... and the only 'blanket' forts any of us ever built were only appropriate for preschoolers... but that makes this book all the more charming. Why shouldn't 'big kids' make more elaborate and fantastical forts with their friends? I love all the details in the pictures, and the poetical language, too. Note that the little sister isn't old enough to play with the gang until Fall, but then is welcomed b I loved it! Note that the little sister isn't old enough to play with the gang until Fall, but then is welcomed by all. And note that the front and back endpapers extend the story. This one's a keeper. Great word choice mentor text. I think it is a charming book. I thought the illustrations were very appealing, and captured all the fun of making different types of forts through the year. This book is so cute! I love the illustrations, which show children exuberantly enjoying the outdoors in every season and--you guessed it--building all sorts of cool forts. Great book for word choice! This colorful book explains, season by season, why it's always fort-building time. The rhythmic descriptions of each season's virtues pair well with the illustrations of happy children enjoying various outdoor activities from snowball-throwing in winter to sandcastle-shaping in summer. This would work well for any kind of STEM storytime with an engineering theme. Follow it up with a fort-building activity using a few old blankets or a storytime parachute and some cardboard boxes. It will be a hi This colorful book explains, season by season, why it's always fort-building time. The rhythmic descriptions of each season's virtues pair well with the illustrations of happy children enjoying various outdoor activities from snowball-throwing in winter to sandcastle-shaping in summer. I love this colorful, vibrant story about friends, seasons, and fort building. Certain to inspire you to run outside and start building your own fort, no matter the season. This is delightfully illustrated book about a timeless childhood pastime. It doesn't have as much story or substance as I hoped for, but will still appeal to many children. I loved this book! It introduces the seasons and how you can use your creativity and imagination during any of them. Well done! Might be able to use this for a STEM storytime. Afterwards, kids could design a fort with cardboard, or a small scale fort with planks or pretty much any building material. Grab your blankets and pillows! From the creators of Finding Wild, a new picture book that follows the changing of the seasons and is as cozy as a fort. Winter, spring, summer, fall. Each season brings new materials to make the perfect fort. From leaves to snow, from mud to sand, there is a different fort throughout the year. As a group of friends explore and build through the seasons, they find that every fort they make is a perfect fort. Megan Wagner Lloyd lives in Washington, D.C., with h Grab your blankets and pillows! From the creators of Finding Wild, a new picture book that follows the changing of the seasons and is as cozy as a fort. Winter, spring, summer, fall. Each season brings new materials to make the perfect fort. From leaves to snow, from mud to sand, there is a different fort throughout the year. As a group of friends explore and build through the seasons, they find that every fort they make is a perfect fort. Megan Wagner Lloyd lives in Washington, D.C., with her family. She loves hiking in the woods and exploring on the beach. Finding Wild was her first book. Visit Megan at meganwagnerlloyd.com. Abigail Halpin grew up in Maine and spent her summers camping with her family. Her previous picture books include Bella's Rules by Elissa Haden Guest and Finding Wild by Megan Wagner Lloyd. She has also illustrated many beautiful covers for novels. She lives in New Hampshire. Visit her at theodesign.com and follow her on Instagram at @abigailhalpin. Thank you to @kidlitexchange for the review copies of this picture book. All opinions are my own. 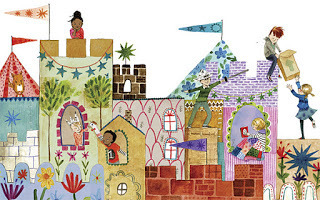 Fort Building Time is an adorable picture book for young children. No matter the season, and no matter the place, it can always be fort-building time! Whether you are making snowmen, hunting for daffodils, building sandcastles, or chasing the leaves through the woods, it is fort-building time! I love how the bright and cheery pictures bring each season and fort-building time to life in the story. The story reminds me of the many times that my sisters, cousins and I build forts when we were children. Whether it was under the back porch, in the bunk beds, under the coffee table, or between the couches, it could always be fort-building time! While all children would enjoy this book, I think it’s more geared for children from preschool - grade 2. Building forts is one of those activities that just about every kid has tried at least one time or another. So this charming picture book will definitely be one that kids can relate to. The poetic text and warm, inclusive illustrations take readers through each of the seasons by listing the fun things to do, and each season includes fort-building! This could be a terrific mentor text to help young writers describe the seasons in their own way. Granted I was the type that was an indoor fort builder, with couch cushions, pillows, blankets, etc. but I could still relate to this great fort building book...a fort for every season! I love how the different raw materials that the seasons and seasonal locations provide, created different forts, each constructed out of what was available. We need to explore of those, what's available, creative opportunities. (As a bonus, the descriptive language, layout like poetry was fantastic!). This book is beautiful and I love everything about it. Fort-Building Time takes you through the seasons in lyrical prose to encourage creative play. Boy, did I need this right about now as I sit here with the gazillionth day in a row of subzero temperatures. Plus, the gorgeous illustrations of quilts weren’t missed by this quilt-making mama. Walk through the seasons and discover the best activities for each one. Obviously, building a fort is always an acceptable activity. The illustrations are colorful and happy...it just made me smile when I read this. Fort building in every season with kids of all sorts inspired my preschool storytime folks to imagine and plan the forts they plan to build when they get home. Whimsical illustrations and lyrical prose make this a favorite! Growing up building blanket forts and now assisting with building forts with my grandchildren, I just loved this book. For every season there is a fort, whether it is made out of blankets or snow. Gather your team and your imagination and see what you can build. Megan Wagner Lloyd is the author of Finding Wild, Fort-Building Time, and Building Books. Upcoming titles include the picture books Paper Mice and The ABCs of Catching Zs as well as the graphic novel Allergic. She lives with her family in the Washington, D.C. area. (Wondering why all my read books on my shelves are highly rated? Because I only put my favorite books on Goodreads. Since I'm an author Megan Wagner Lloyd is the author of Finding Wild, Fort-Building Time, and Building Books. Upcoming titles include the picture books Paper Mice and The ABCs of Catching Zs as well as the graphic novel Allergic. She lives with her family in the Washington, D.C. area.